There are so many exciting collections out at the moment, yesterday I shared a piece from the Look Magazine collab and today I've got a piece from the Cut for Evans collection. For those of you unfamiliar, Cut for Evans is a really exciting initiative launched by the brand last year, where fashion students are briefed to design exciting collections which then go through to a judging panel. The two best collections are put into production and voila! I love that this collection has a strong knitwear element. Knitwear, especially plus size knitwear can be incredibly dull, this piece in particular combines texture, colour and structure to make a really wearable yet striking piece. I picked this gorgeous navy textured panel dress up on special offer, at full price it's £55 but the quality is immense and the amount of use I'm going to get out of it over the winter totally justifies it, also the fact this is designed by new fresh talent and is quite different to anything we've seen before makes it all that more special. I'm wearing the size 22/24 which is true to size, it's not overly fitted but skims my figure nicely. If however you'd like a more body con feel, I'd size down. I'm more than happy with the fit though, it's perfect for keeping things casual with just a little oomph! 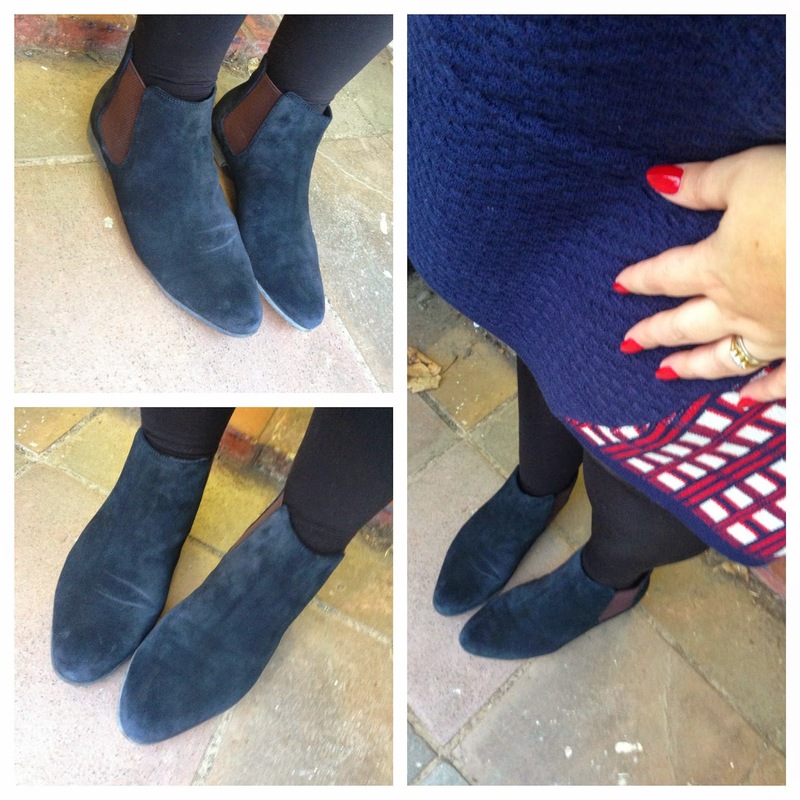 I teamed my dress with black tights for a contrast against the blue (I also wore a black biker jacket when I went out) and my new navy chelsea boots from Clarks. I fell in love with the black ones so much, I went ahead and bought these blue ones too! I love the sculpting details of this dress - really figure enhancing for us curvy girls! I promised myself just this evening that I won't buy any more clothes until I go to the Manchester Christmas markets on 12th December, and here I am with the Evans site open because you and Diamonds and Pearls have posted about the Cut for Evans collection. I LOVE that dress on you, it's bloody gorgeous and should be in my wardrobe! Oh well, will just have to hope it's still in stock next month!